Warning: This game is really blocky. If you absolutely hate blocky games, this is not the game for you. Might as well quit reading now. 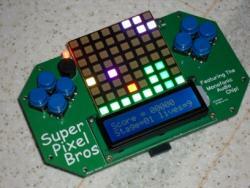 using a boring ol' LCD panel for his display, he used an 8 by 8 array of multicolor led lights. So the whole display was 64 pixels. he wrote a platform game for his system that he called "Super Pixel Brothers". Despite the low resolution, it is quite fun to play. "So what?" you ask. "What do we care?" to Nanochess and friends, Intellivision has its own basic compiler - IntyBasic! So, all we have to do is slap the Super Pixel Brothers Basic source into IntyBasic, hit compile, and we can enjoy Mario style platform goodness? First, RetroBrad's portable system has a unique architecture, with red, green, and blue, bit planes combining to form each pixel. The Intellivision has its own unique design, with gram and grom and backtab and the like... The controls and sound systems are completely different, too. Second, not all basics are created equal. For example, the Basic RetroBrad used (Swordfish Basic) had mult-line "if then else endif" statements, whereas IntyBasic has single line if statements. In short, it was a lot of work. But now, you can enjoy low res platforming goodness on your Intellivision. program is to use the --jlp extension when compiling. The resulting program will only run under the jzintv emulator with the --jlp switch enabled. sweet! another game. i can never complain about that. I'm wondering if it's possible post the BIN+CFG files, rather than the ROM file? Thanks! It's not showing me the RAM in the cfg file (typing rom2bin spb.rom). Maybe I'm doing something else wrong... will try again. No, for some reason this game (compiled with the --jlp switch) works differently - the ram doesn't show up in the config file. 0x8040                  SYSTEM:	ORG $8040, $8040, "-RWBN"
Oh! yes, intvnut said that the --jlp option in jzintv is incompatible with putting RAM mapper in the cfg file, so IntyBASIC doesn't generate the mapping. Talking about that, using the --jlp option in IntyBASIC also activates use of multiplication/division accelerator, I've plans to put a --cc3 switch that only activates RAM but not the usage of multiplication/division accelerator. I'll never really understand the fascination with SMB, but I do understand the desire to do something no one thinks is possible and requires you to bend your brain in half solving problems, so I like this project - a lot. Can I assume that if you're multiplying by 240 or 960 it'll use the accelerator? How about 11 or 10 or 3 or 5 or 6 or 7? Yes, a switch for RAM but not acceleration would be great. catsfolly, could you provide the required sticdefs.bas file? I'm trying to re-compile using only bit-shifting multiplication and division (and trying to cheat with the /10 by changing that to /8, at least for now). There's clearly something technical that I'm failing to grasp. How the hell does a game like this require extra RAM? For almost everything except the simplest multiplications, like x2, x4, x8 and so. Oops, I forgot to include that. The game only does multiplication the normal CP1600 way. The player can destroy any block on the level that they can collide with, and they can scroll back to any area in the current level that they have previously been to. 120 columns in a level * 8 bits vertical * 4 bits per pixel (rgb and collision) = 3840 bits = 480 bytes of storage. to store one level. So extra ram is required for a straightforward storage of the level data. I could try just storing 1 bit per level block in memory (to indicate the existence of the block) and then use the level data in the rom image to determine the characteristics of the block if it exists. This would require only 120 bytes per level, but it might be slow at scrolling the level and colliding, etc. Thanks for the file. I was able to run it on my new PCB, although I'll need to spend some time to review the lines of code with "/10", because I started at level 0... it played normally, though, and loaded some proper level data into RAM. Ahhhhhhhhhhhhhhh. In the original SMB you couldn't go backwards, so there was never a need to store an entire level data (other than in ROM, which we have gobs of). Obviously this is a quirk introduced into the handheld. I love ports of ports. You end up with this wonderful mish-mash of features. A little from column A, a little from column B, with everyone leaving their own stamp on the project. I reviewed the code generated by IntyBasic, and it turns out there was exactly one place where I was using the accelerated multiply - in the "write lcd" code. Then all the multiplies are done by the regular Intellivision processor (as far as I know). Folks often underestimate the cost of mutable level state. The original SMB only allowed forward scrolling, and only kept track of about one screen's worth of off-screen detail, which help keep things bounded. As I recall, the offscreen state basically corresponded to the double-buffer allocated to hardware scrolling on the NES's PPU. The Intellivision equivalent would be to store the flags in the 'extra bits' in BACKTAB, and once something went offscreen it was forgotten. That seems a bit too far beyond the spirit of the original Super Pixel Bros.
Edited by intvnut, Tue Dec 23, 2014 5:29 PM. Thanks!! I will give those a try soon... .
Edited by pimpmaul69, Tue Dec 23, 2014 10:44 PM. Hmm... -z1 shouldn't have anything to do with the price of fish. It should have no bearing whatsoever on the --jlp flag. Edited by intvnut, Tue Dec 23, 2014 10:58 PM. Ok, that's not a jzIntv error. Somehow the flag isn't getting conveyed to jzIntv correctly.